We made meaningful progress toward these long-term goals for fiscal 2011, despite significant external challenges. Organic sales grew 4%. Organic volume grew 5%. Core earnings per share grew 8%. Free cash flow productivity was 84% of net earnings. 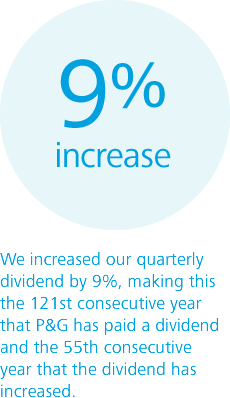 We increased our quarterly dividend by 9%, making this the 121st consecutive year that P&G has paid a dividend and the 55th consecutive year that the dividend has increased. (1) Organic sales growth is a non-GAAP measure of sales growth. See MD&A Other Information for a reconciliation of net sales growth to organic sales growth. (2)	Core EPS growth is a non-GAAP measure of the Company’s diluted net earnings per share from continuing operations. See MD&A Other Information for a reconciliation of Core EPS to diluted net earnings per share from continuing operations. (3)	Free cash flow productivity is defined as the ratio of free cash flow to net earnings. Over the past 55 years, P&G’s dividend has increased at an annual compound average rate of approximately 9.5%. In total, we paid approximately $5.8 billion in dividends in fiscal 2011. We also returned $7.0 billion to shareholders through the repurchase of P&G stock. Based on our current market capitalization, dividends and share repurchase, we provided shareholders with an effective cash yield of nearly 7%, with additional potential for capital appreciation. We are executing the strategy as planned, with unrelenting focus on innovation. We are increasing productivity, which frees up resources to invest in innovation. We continue to strengthen our portfolio of businesses. We are tackling growth challenges head on. We have solid, executable plans in place to capture the enormous growth potential that our strategy creates. Further, P&G people are inspired and are performing heroically to improve lives, to grow our business, and to create value for our shareholders. My objective, with this Letter, is to explain what we are doing in each of these areas. P&G’s Purpose is to touch and improve people’s everyday lives. This is an inspiring but demanding aspiration. There are nearly seven billion people on the planet today and we are currently reaching about 4.4 billion of them. We want to reach all of them with products and services that make their everyday lives a little better. We know that if we do this well, we’ll be rewarded with sales and profit growth, market share leadership, a strong company reputation and, ultimately, the creation of value that allows our people, our shareholders and the communities in which we live and work to prosper. Our growth strategy, which we established two years ago, is inspired by our Purpose. We are executing this strategy by innovating to improve people’s everyday lives in every part of the world, and by then expanding our portfolio of innovation up and down price tiers, into new markets, and into new and existing product categories. This strategy is fundamentally right for P&G because it inspires our people and our partners, focuses us where the growth opportunities are greatest, and leverages our core strengths: consumer understanding, brand building, go-to-market capability, global scale and, most importantly, innovation. Innovation is the driving force behind our strategy, as it always has been at P&G. Our experience has proven that price promotion may win a quarter here and there, but innovation wins decades. There are many examples to prove this. Take our Laundry business in the U.K., for instance. In the late 1970s, we were competing hard just to defend and maintain our 35% market share leadership position. We then stepped up our innovation efforts. In the three decades since, we’ve introduced a series of game-changing innovations such as Daz automatic detergent, concentrated liquid detergent, and most recently, Liquitabs. We now enjoy around a 50% share. We’ve seen the same dynamic in Oral Care. In the 1990s, we lost our historical lead versus our top competitor because they simply out-innovated us. We stepped up our innovation game once again and delivered a string of product breakthroughs including Crest Whitestrips, Crest Pro-Health, and Crest 3D White. We restored P&G’s leadership of the U.S. Dentifrice category, which is now enabling us to expand these innovative products around the world. I’ll share one more example. Head & Shoulders was a relatively small, primarily North American brand a decade ago. We invested in a combination of marketing and product innovations and then began to expand the brand globally. Since then, we have more than tripled sales and Head & Shoulders is now the largest shampoo brand in the world. These and other experiences reinforce our commitment to innovation as the fundamental driver of P&G’s growth. 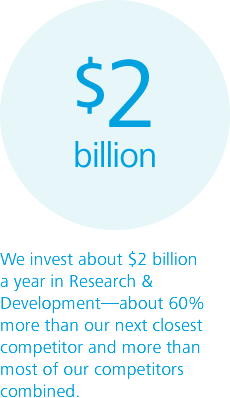 We invest about $2 billion a year in Research & Development—about 60% more than our next closest competitor and more than most of our competitors combined. The investment continues to pay off. We currently have the strongest innovation and global expansion program in P&G history. We are globalizing products such as Gillette Fusion ProGlide, Crest 3D White, Laundry additives, and the Pampers thinness and absorbency upgrade. We’re also expanding successful marketing innovation such as the Shiksha education program in India, in which P&G contributes a brick to build a school for each pack of product purchased, or the Pampers “One Pack Equals One Vaccine” campaign with its focus on eradicating maternal and neonatal tetanus. The Old Spice “Smell Like a Man, Man” campaign generated consumer excitement and demand that catapulted the brand to market leadership. P&G’s global sponsorship of the Olympic Games provides an outstanding platform for integrated, multi-branded commercial innovation. In this past fiscal year, we grew or held market share on businesses representing about 60% of our sales, which is the best indication that consumers are rewarding P&G innovation despite a highly competitive and demanding economic environment. We also continue to earn external recognition for our innovations. In 2010, P&G launched eight of the top 25 most successful new products in the consumer products industry in North America, as measured by SymphonyIRI Group (which recognized us last year as one of the most innovative manufacturers in the U.S. Consumer Packaged Goods Industry for the past decade, presenting us with an Outstanding Achievement in Innovation Award). Crest 3D White was the most successful new product launch measured by SymphonyIRI Group last year. For the past 16 years, P&G has had 132 products on the top 25 New Product Pacesetters list, more than our six largest competitors combined. In 2011, P&G along with our agencies brought home a record-setting 32 Cannes Lion awards (which recognize the world’s best advertising and communications) at the Cannes Lions International Festival of Creativity (formerly known as the International Advertising Festival). This was nearly double our previous record of 17—and more than double the combined number of Lions awarded to our six closest competitors. We were also awarded the title of Most Effective Marketer in the World by Effie Worldwide. All this reflects P&G’s deep and abiding commitment to innovation, which is always the best driver of long-term sustainable growth—for P&G’s business and for the categories in which we compete. 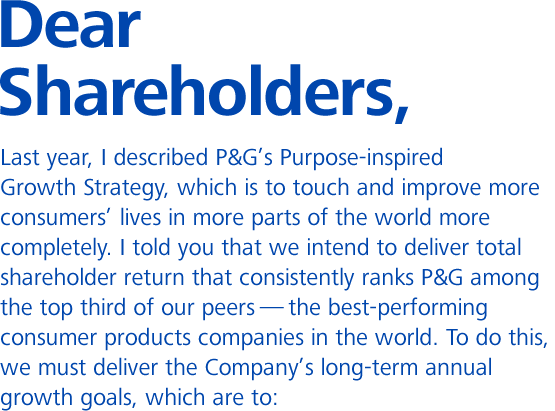 In the section that follows this Letter, you will find a series of stories that bring P&G innovation to life—stories that show how P&G people innovate for the way everyday life is lived and, as a result, improve lives in every moment of the day, in every part of the world, through everything we do. 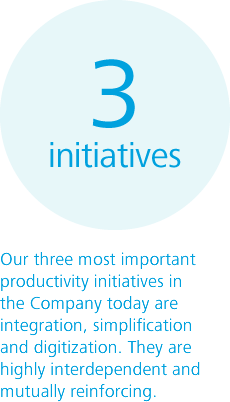 Productivity is the second critical growth driver for P&G. Improved productivity frees up resources to invest in innovation that improves lives and drives top- and bottom-line growth. It is a virtuous cycle. Our three most important productivity initiatives in the Company today are integration, simplification and digitization. They are highly interdependent and mutually reinforcing. Integrating to operate more fully as a single company is the way we turn our size into scale and our scale into faster growth and cost advantage. For many years, the focus was on individual brands. We then shifted to managing on a regional product category basis and, later, to a global category basis. We’re now operating through Global Business Units and Market Development Organizations to go to market as a single Company, rather than as categories, and have expanded our Global Business Services organization to scale work and to provide better operational support at lower cost. For the most part, each of these evolutionary steps made P&G more cost efficient and incrementally faster, but we still weren’t getting the full benefit of our scale. We are now beginning to reap greater scale advantages by integrating as one Company. There are multiple efforts under way throughout the organization, but I’ll highlight three of the most important ones to illustrate how we create Company scale. We are creating multi-category plans for our top-priority developing markets. These are plans that bring together multiple categories and multifunctional capabilities in ways that an individual brand or category team could not. They reduce affordability barriers, accelerate speed of market entry, increase relevance to distributors, retailers, governments and potential employees, and create greater probabilities of success. We’ve launched these plans over the past 18 months in several markets, including the BRIC countries (Brazil, Russia, India, and China) and successfully accelerated our historic growth rates. Brazil is a good example. Our integrated plan for that market will double the number of categories in which P&G competes in the next few years. We launched two new categories this year (Skin Care and Air Care) with three more planned for 2012. We’ve accelerated sales growth from a 12% average over the 2006–2009 period to 28% in 2010 and 32% this past year. We’ve seen similar results in other countries. We will continue to execute these plans in our top-priority developing markets over the next several years. We’re creating more multi-brand programs such as our Olympic Games sponsorship, Future Friendly (an environmental sustainability initiative) and P&G Brand Saver (a dedicated newspaper insert of advertising, coupons and consumer education). These multi-brand initiatives earn significantly higher returns than many independent brand programs. They benefit from association with P&G as the parent company, cost less to execute, and attract broad retail support. Here, too, we can bring a broad, strong and diverse mix of leading brands to these executions that other companies with narrower portfolios simply cannot do. We’re moving from large, single-category manufacturing plants to more localized, scaled multi-category facilities that enable us to lower cost by leveraging the same infrastructure (utilities, roads, rail spurs—which are often up to 50% of the cost of a new plant), as well as lower transportation and delivery costs. Accelerating local production also enables us to use local talent and materials. At the same time, these operations enable us to improve customer service with more frequent multi-category full-truck deliveries. This, like multi-brand commercial innovation, creates competitive advantage that is difficult for more narrowly focused competitors to match. Simplification is also a critical driver of productivity. We’re pursuing opportunities in a wide range of areas, two of which are the most far-reaching. We’re simplifying the business by creating standard manufacturing platforms with common packages, formulas, materials, equipment and operational systems. This enables faster speed to market and concurrent product launches across regions at a lower cost. We’re moving from more than 500 manufacturing platforms as of two years ago to a target of about 150 platforms by 2014. We think this is worth about $500 million in savings worldwide. Product simplification is also a big opportunity. Today, we have more than 50,000 unique products and we believe we can increase the productivity of our portfolio of offerings by 30% over three years. We are investing in new tools and using deep shopper insight to simplify product lines and increase consumer and shopper satisfaction. Our research shows that in certain categories shoppers feel they have more choices after category options are reduced because there is less clutter and confusion; they can more easily find the product that meets their specific need. P&G currently has 5,000 Product Supply Planners distributed over 300 locations globally. Over the next three years, we will consolidate planning tasks into regional planning centers and implement new simulation tools. This centralization and digitization will improve productivity and create deeper, more sustainable organizational capabilities. Simplifying our planning processes and implementing new technologies will lower transportation and warehousing costs and improve productivity by 25% or more. Packaging simplification is another big opportunity. P&G spends over $5 billion annually on packaging materials and more than $250 million on packaging development costs. The packaging development process touches every function in the Company, involves more than 3,000 employees, and has significant opportunities for simplification and cost savings. We are implementing virtualized end-to-end packaging development tools, which we believe can drive a 30% reduction in packaging costs and release 30% of the time spent today on package design. Our third major productivity effort is dramatically increased use of digital technology. Our intention is to make P&G the most technology-enabled company in the world. We are achieving this by focusing on four key areas: We want to enable one-on-one relationships with customers and consumers around the world; we are focused on harnessing the power of real-time business intelligence to aid decision making; we are accelerating innovation by using digital technology to create visibility from molecule-creation to the store shelf; and we are standardizing best-in-class systems to integrate data. 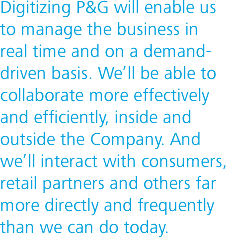 Digitizing P&G will enable us to manage the business in real time and on a demand-driven basis. We’ll be able to collaborate more effectively and efficiently, inside and outside the Company. And we’ll interact with consumers, retail partners and others far more directly and frequently than we can do today. We’re already seeing the benefits of digitization. We are increasingly making business decisions faster and more collaboratively with real-time data. We’re using virtual reality technologies to reduce cost and increase the speed of innovation. We are reducing the number of physical product mock-ups created for new product initiatives. Virtual shelving and displays are simplifying the way we test our brands with top customers, and new product modeling tools are improving our engineering and design productivity. Employees are connecting faster through high-definition technology that is reducing the need for travel by as much as 20,000 trips per year, saving $50 million annually. All these productivity efforts are focused on one goal: high-quality profitable growth achieved on the strength of P&G innovation and with the financial and operational discipline that you expect of P&G—and which we demand of ourselves. We continue to take steps to strengthen P&G’s portfolio of businesses, which enables us to focus on our greatest growth opportunities. Two years ago, we exited our pharmaceuticals business. This was an industry where the innovation model did not play to P&G’s strengths, where there was little go-to-market synergy with the rest of P&G’s businesses, and where branding was inherently difficult and less relevant. 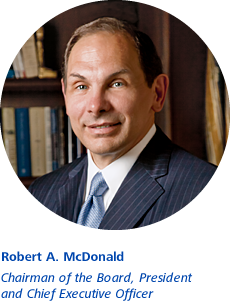 We felt that exiting pharmaceuticals would allow us to focus our efforts on consumer-oriented health care, where we can more clearly apply our Company’s strengths and where there are strong economic and demographic tailwinds. We are advancing this over-the-counter (OTC) focus with the intent to form a joint venture with Teva Pharmaceutical Industries, which we announced earlier this year. We will maintain our North America OTC business, which generates 60% of our total OTC sales. We will gain access to Teva’s manufacturing scale as the largest prescription drug manufacturer in the world, to their library of molecules including several prescription-to-OTC switch portfolios, to their highly effective regulatory capabilities, and to best-in-class pharmacy coverage in many markets. Teva will further strengthen its position with major pharmacy customers around the world and leverage P&G’s consumer understanding and brand-building strengths. This partnership will allow both companies to significantly accelerate entry into additional OTC categories and markets. Negotiations continue to progress well as we work to close the transaction by the end of this calendar year. We closed the Ambi Pur acquisition and have completed a successful integration. Through a combination of the acquisition and organic expansions of the Febreze brand, we have grown our Air Care presence from 17 markets to nearly 90 markets. And, most recently, through a disciplined approach and two rounds of negotiations, we agreed to divest Pringles to Diamond Foods. This transaction is expected to close by the end of calendar 2011 and will complete P&G’s exit from the food and beverage business. Strengthening our business portfolio is an ongoing process. We continually evaluate the strength of our portfolio by assessing category attractiveness across three dimensions: industry attractiveness (market size, growth and structural economics), competitive position (share, profitability versus industry, brand equity/consumer purchase intent versus competition), and portfolio fit (ability to apply the Company’s core capabilities of brand building innovation, consumer understanding, go to market and scale). Based on this evaluation, we believe that our current portfolio is the strongest it has been in many years and provides a highly strategic platform for market leadership and sustainable growth. These are the cornerstones of P&G’s growth strategy and our ability to create sustainable shareholder value: innovation that improves everyday life in every part of the world … fueled by productivity that frees up resources to invest … in a portfolio of businesses and brands designed for growth. As we executed the Company’s growth strategy this past year, we faced a number of extremely challenging external headwinds—two of which are most important and most likely to continue in the year ahead. We are facing rapid and significant increases in commodity costs. Materials and energy costs were up more than $1.8 billion before tax for the fiscal year. We’re taking a holistic approach to manage these cost increases. We’re turning up the dial on our productivity and cost-savings initiatives, as indicated previously. We’re creating alternative product formulations and developing materials that use renewable feedstocks. We’re reducing our dependency on commodity and energy costs through our own and our suppliers’ sustainability efforts. We’re increasing prices where necessary, coupled with innovation where possible, to deliver the best consumer value. We expect commodity costs to continue escalating in the year ahead and will remain highly disciplined to ensure we can offset increases as fully as possible while continuing to invest in growth and create shareholder value. Developed markets are growing slower than expected. These markets—principally North America, Western Europe and Japan—account for about two-thirds of our sales. Their underperformance reduced total Company growth by one percentage point in fiscal year 2011. Our primary response to slow-growth markets is innovation—the only sustainable way to grow faster than the markets in which we compete. Innovation creates consumer value, stimulates market growth and attracts retail support. We don’t anticipate accelerated economic recovery in developed markets in the coming year, but we remain confident that our focus on creating and expanding innovations will enable us to grow even where underlying market growth rates remain soft. I have spent most of this Letter explaining the factors that are driving and challenging P&G’s growth today. I want to conclude by looking forward and reaffirming my strong confidence that we have the right strategy and supporting capability to grow well into the future. The growth opportunities created by our strategy are clearest when you look at population and economic growth trends and our geographic expansion plans. It’s estimated that the world’s population will be nearly eight billion people by 2020. All these people—in developed and developing countries alike—will have the same fundamental needs, wants and aspirations for products and services that make their lives better. There is tremendous potential for P&G to grow by meeting those needs. We are going after this potential by making our products available in more categories, countries and channels, expanding product lines to meet a fuller range of regimen needs, and stimulating market growth. We currently compete in a total of 38 product categories. Today, on average, we compete in 19 categories in any given country. In our most developed market, the United States, we compete in 35 product categories. In Russia and Mexico, we’re in the 20s. In China, Brazil and India, we’re in the mid-to-high teens. In Nigeria, we’re in the mid-single-digits. Our five-year plan will increase the average number of categories from 19 to 24. Within each of these categories and countries, there are generally five distinct price tiers—ranging from the best performing and highest priced products in the super premium and premium tiers, down to products that offer basic benefits at a lower price in the value tier. On this basis, we currently compete in only about one-third of the potential segments. Here, too, we are expanding our presence. We’ve recently introduced the Crest 3D White lineup, Gillette Fusion ProGlide, and Olay ProX as premium products. At lower price points, innovations such as Gillette Guard (our entry point razor system in India), Pampers Simply Dry and Gain Dishwashing Liquid are attracting new consumers to P&G brands. We are also making P&G brands available in more retail channels. Today, we compete in less than 40% of possible channel segments. Across the seven predominant channels, the vast majority of our current business is in four of them. We are executing plans now to increase our presence in all channels. We are filling out product lines to fulfill consumers’ regimen needs. A good example is Pantene in Japan, where we have recently redesigned our regimen and pricing strategy. Japanese women are meticulous about caring for their hair. Many use up to eight steps throughout the day. It starts with a nighttime shampoo washing, then a conditioner and in-shower treatment. Then she uses a jar treatment before bed. In the morning, she uses water to get the frizz out and applies a leave-in treatment. She carries a tube treatment in her purse for midday application, and she applies another treatment when she gets home in the evening. We were previously serving her in only a few of these subcategories. By launching a full line, addressing all points in her regimen, we’ve increased our average sales per unit of Pantene by nearly 15% and market share has continued to grow. In addition to entering and creating new markets, we need to grow our current markets, which we do by driving usage frequency and trade-up to higher value items. Consider our position in the diaper market in Egypt. Pampers currently has roughly an 80% share of the disposable diaper market. However, only about 10% of changes are done with disposable diapers. The rest are done with cloth or nothing at all. In India, Duracell has a share of over 75% of the alkaline battery market—which sounds good, until you realize that only about 3% of batteries used are alkaline. Our growth in these markets will not be dependent on growing share. It will be dependent on growing markets. We have seen firsthand how fast markets can develop when we launch new innovation and build broad-based consumer awareness of our products. For example, the size of the Greater China diaper market was only $200 million in the year 2000—when Pampers was just starting to gain a foothold. Today, the China diaper market is $2.8 billion—an increase of 14 times in ten years. This level of market growth happens when brands like Pampers innovate in ways that genuinely improve people’s everyday lives. We know, for example, that when babies stay dry throughout the night, they sleep better, which in turn helps them grow and develop. We innovate based on insights like this and consumers reward us because they value the improvements our innovations bring to their lives. We want to bring this kind of innovation to more consumers in more parts of the world, and we have abundant opportunity to do so. In China and India, the average consumer changes a diaper less than once per day, in Brazil twice per day and in the U.S. four times per day. Getting China and India usage levels up to the levels of Brazil represents not only a $2.5 billion opportunity for Pampers, but also the chance to improve parents’ and babies’ lives in very fundamental ways. In India, the market size for wet shaving systems grew by 15% in just one year following the launch of our low-cost Mach3 razor. We’re working to accelerate that growth with Gillette Guard. Developed markets can also be stimulated to drive higher growth as we demonstrated with the Febreze “I Wish I Could Wash” advertising campaign in Japan, which restored the growth of the brand in that country. Clearly, we see huge opportunities for growth, and for our consumers, behind our Purpose-inspired Growth Strategy. We are expanding into more categories, countries, and channels. We are meeting a broader range of consumer needs. We are stimulating market growth in developed and developing markets alike. And our portfolio of businesses presents abundant opportunity to grow. We have the largest Beauty and Grooming business in the world, with a market share of only 18%. We have the second largest consumer health care business in the world and we have only a 6% share. In Household Care, our oldest and most developed business, we have only a 27% share. Increasing market share by five points in each of these three businesses is more than a $20 billion sales opportunity. Looked at a different way, we generate annual sales of about $96 per person in the U.S. today. We generate about $20 per person in Mexico. Our sales in China are only about $4 per person. Indonesia is just over $1, and India and Sub-Saharan Africa are just under $1. Getting per capita spending on P&G products in these four big markets up to the level of Mexico would add more than $60 billion to annual sales. Economic growth should help. A study released in November 2010 by the Boston Consulting Group projected that over the next decade China will add 270 million consumers to its middle-income and affluent class. This is roughly the same number as there are in the U.S. today. The study went on to say that 41% of the current middle-income and affluent class plans to trade up to more premium products—especially in packaged goods and clothing. In 2009, when we established our growth strategy, we were serving four billion consumers. We established a goal of increasing the number of consumers we serve by 1 billion by 2014/15. Last year, we served 4.2 billion consumers—and remain on track to serve 5 billion by 2015. 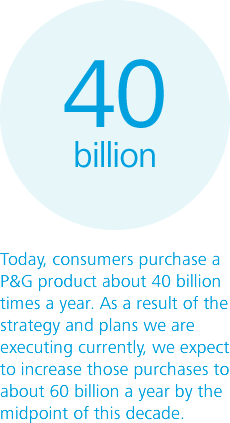 Today, consumers purchase a P&G product about 40 billion times a year. As a result of the strategy and plans we are executing currently, we expect to increase those purchases to about 60 billion a year by the midpoint of this decade. The opportunities described above are a big reason why I am so confident in P&G’s growth strategy, but the most important reason of all is the most fundamental: Our strategy inspires extraordinary performance by everyone called upon to help execute it. When we commit ourselves to touch and improve everyday life, for ordinary people in every part of the world at every moment in their day, we inspire higher levels of performance. A strong sense of Purpose focuses us on the consumers we serve and inspires empathy for them that, in turn, leads to insights, big ideas and innovation that drive growth. Last year, we established a new measure of organizational health in our annual Employee Survey—a measure designed to assess whether P&G people believe in our Purpose and can connect it directly to their day-to-day work. This is important because we know from the Survey analysis that when employees feel connected to P&G’s Purpose, they are able to give their best performance to the Company. The vast majority of employees tell us they are inspired by our Purpose and can see how their day-to-day work touches and improves lives. Nearly all cite their pride in being part of the P&G Family. These are encouraging results. They reaffirm my conviction that people seek meaning in their lives and their work. They want to be part of something positive, something bigger than themselves. They want to know they can use their time and talents to make a lasting difference in the world. The opportunity to find such meaning, to make such a difference, is what attracts people of remarkable character and caliber to P&G. I am proud to stand alongside them all. I am confident in their ability to innovate for everyday life, and to deliver the top- and bottom-line growth you expect from Procter & Gamble. © 2012 Procter & Gamble. All claims valid only in the U.S.